Plomin power station is a two-unit coal-fired power station in Plomin, Croatia. Plomin C is a proposed 500-megawatt (MW) expansion, which would replace the 125 MW unit 1. It was cancelled in 2016. The undated satellite photo below shows the power station in Plomin. Plomin Power Station is 335 MW. The first generating unit, referred to as Plomin 1 or A, is a 125 MW unit. It was commissioned in 1969. The second generating unit, referred to as Plomin 2 or B, is a 210 megawatt unit which was commissioned in 2000. Plomin 1 coal plant closed in 2017 due to a fire, the same year it was supposed to comply with EU pollution control regulations by the end of 2017 or close. In late 2017 the Ministry of Environmental Protection and Energy announced that HEP had applied for an extension of the plant’s environmental permit and that it plans to extend the plant’s lifetime for another 15 to 20 years, without a new environmental impact assessment. Croatian environmental groups Zelena akcija, Zelena Istra and Greenpeace Croatia are challenging the application. The Plomin 1 plant is owned and operated by the Croatian electricity company HEP Proizvodnja. The Plomin 2 plant is owned by TE Plomin, a 50:50 joint venture between HEP Proizvodnja and RWE Power. The plant is operated and maintained by HEP under a long-term contract with TE Plomin. HEP is proposing that a new 500MW unit replace the aging Plomin 1 plant, at the site of the existing Plomin Power Station. As a result, the Plomin Power Station capacity will increase from 335 MW to 710 MW. Plomin C was originally presented as a reconstruction of the Plomin A Power Plant, even though its capacity is planned to be four times larger than Plomin A, which was 125 MW. This has generated discussions on the legality of the project among local and international groups, as well as from local officials. The project is planned to end by 2018. In February 2016 Croatia's environment minister said the country was unlikely to build the plant, saying Croatia needed a new energy strategy in line with the European Union plans on boosting renewable energy and reducing CO2 emissions. The minister is part of the centre-right government that took office in January 2016 and has favored renewable power, although the party later said they did not want to drop Plomin C but instead adjust it to be acceptable to the European Commission. In March 2016 Croatian state-owned HEP and Japan's Marubeni said they were seeking contracts on the construction and management of the Plomin C plant, estimated at 800 million euro (US$887.9 million). In June 2016 the Croatian Minister for Economy, Tomislav Panenić, said the project had been stopped. According to Bankwatch: "the announcement comes after months of media reports that the European Commission considers the project to involve incompatible state aid due to the involvement of heavily politicized state electricity company HEP (Hrvatska Elektroprivreda). This was confirmed by Panenić, who also cited low electricity prices as rendering the project uneconomic." The proposed plant is opposed by environmentalists. The Croatian environmental group, Zelena akcija (Green Action) has objected to the government's support for the project. It argues that the Croatia's Physical Planning Strategy states that only a 125 megawatt gas power plant could be built at the site but that the Construction and Physical Planning Ministry had designated the Plomin C expansion as the "reconstruction of the complex Plomin facility." Toni Vidan from Green Action warned that the Ministry's decision set a dangerous precedent "which any investor can abuse and completely sidestep existing restrictions in physical planning documents." "The spatial plan for Istria county, where the plant would be situated, says that if a new unit is built at Plomin, the total capacity of the units together must not exceed 335 MW. As the existing Plomin II unit has a capacity of 210 MW and the 120 MW Plomin I plant is to be closed, this means that any new plant at the site cannot have a capacity larger than 125 MW. The spatial plan further states that any third unit at Plomin must run on gas, not coal." "While the first two points are left aside due to lack of binding legal obligations and a clear sustainable long-term vision for Croatia's energy system, the Ministry of Spatial Planning and Construction has a clear duty to point out the last issue through its representative on the EIA commission, but it has not." Ivcic also wrote that "building one plant of 500 MW means that the country will be unable to meet EU 2050 climate goals of 80-95 percent CO2 reductions compared to 1990, and will stifle the development of renewable energy and energy efficiency." The Croatian Green Party, Zelena Lista, has also expressed opposition to the project. In March 2015 a local referendum resulted in 94% of respondents voting “No” to Plomin C.
In September 2012 HEP announced that it had received seven expression of interest from companies interested in the construction and operation of the proposed Plomin C plant. HEP announced that "by September 28, HEP will draw a list of potential partners who will be invited to submit binding bids by the end of this year. The selection of the Strategic Partner will be made in accordance with published criteria, with particular regard to the level of participation of domestic companies in the project." While RWE would have been a prime candidate for participation in the project, RWE announced that it had decided not to submit an expression of interest. The company stated that this decision "is mainly founded by adjustments in RWE’s strategy regarding the structure of its European power plant portfolio and current capital constraints ... RWE expressed its interest to support the project as owner’s engineer of HEP, by operation and maintenance of the plant and with regard to fuel procurement and power sales." HEP is planning to finalise the preferred project partner by mid-March 2013. On the same day that the expressions of interest closed, the Croatian Prime Minister Zoran Milanovic endorsed the project as being important as Croatia "imports HRK 15 billion worth of electricity a year, which is wasteful." On May 1, 2014, the Croatian government reported that three consortia had submitted bids to be startegic partners in the power station. Although the government said it could not name the companies involved due to the tender rules, local media reported that the consortia consist of Marubeni and Alstom; Daewoo and Croatian pension funds; and Edison and Samsung. In 2015 it was reported that Alstom was the planned contractor for Plomin C, along with the Japanese consortium leader Marubeni. 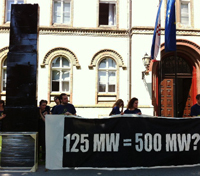 According to a 2014 legal analysis by Hungary's Environmental Management and Law Association (EMLA), HEP's planned long-term power purchase agreement - in which HEP will commit to buying at least 50% of electricity from the planned Plomin C power plant for 20-30 years - is likely illegal under EU state aid rules, as it would be considered state aid, and state aid provided to economic actors is generally illegal in the EU, although particular aid is allowed in certain circumstances. In February 2016 the newly elected ruling party said it wanted to adjust plans for Plomin C so that it would be acceptable to the European Commission. The global legal and PR firm Hunton & Williams announced in August 2012 that it had been appointed to "advise on an international tender for the design, engineering, financing, construction, operation and maintenance of" the Plomin C project. The company stated that Kirk Lovric and Ryan Ketchum will be advising HEP from the firm's London office. The company boasted that the project was the latest in a string of work on coal-power projects in Europe. The cost of Plomin C was estimated at EUR 800 million in 2015. The project is getting advisory services from French private bank Crédit Agricole, despite the bank's May 2015 decision to both end finance for new coal mining projects and stop all support to specialized mining companies. In September 2015 the bank announced its new policy now rules out finance for coal power plants in high-income countries, which includes Croatia. Finance: The project has been estimated to cost €800 million. ↑ "About Us", HEP Proizvodnja website, accessed September 2012. ↑ The Government of the Republic of Croatia, "Starting a New Investment Cycle in the Republic of Croatia in the mandate 2012-2015 -projects background-", March 2012, page 7. ↑ "Activists against Plomin C coal-fired thermal power plant", daily.tportalhr, June 19, 2012. ↑ 13.0 13.1 Bernard Ivcic, President of Zelena akcija/Friends of the Earth Croatia, "Environmental study for illegal coal plant gets thumbs up in Croatia", Bankwatch, June 21, 2012. ↑ "Green activists against coal-based Plomin plant", daily.tportalhr, July 25, 2012. ↑ "Seven companies expressed their interest in Plomin C TPP", Media Release, September 14, 2012. ↑ RWE Power, "RWE is interested to support Plomin III as owner´s engineer of HEP", Media Release, September 14, 2012. ↑ "Cacic believes that new Plomin power plant will be finished in 2017", daily.tportalhr, September 18, 2012. ↑ "PM says Plomin C to use cleaner technology", daily.tportalhr, September 14, 2012. ↑ "Hunton & Williams Advises on €800m Power Plant in Croatia", Media Release, August 17, 2012. ↑ "30 companies express interest in construction of Plomin C", daily.tportal.hr, August 9, 2012. Ekonerg, "Non-technical summary of the Environmental Impact Assessment Study of TPP Plomin reconstruction – replacement of existing TPP Plomin 1 aiming at modernization and capacity increase", HEP, May 2011. HEP, "Notification of Requests for Expressions of Interest", HEP, July 2012. The Government of the Republic of Croatia, "Starting a New Investment Cycle in the Republic of Croatia in the mandate 2012-2015 -projects background-", March 2012.